The movie is faithful to the book’s plot only in its actions, and not in its motives. 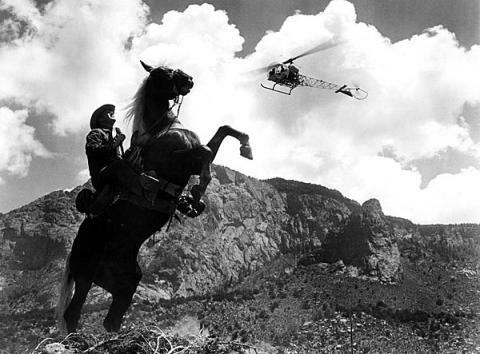 The cowboy Jack does ride into town on his horse with the intention of busting his old buddy Paul out of jail; he does kiss Paul’s wife in the process; he does end up in the mountains fighting an archetypal battle against the sheriff and his men, complete with military technologies and sweeping vistas. It is, in short, a fine Western. What the movie version left out, however, is Jack and Paul’s past together as political protesters. There’s no mention of what Paul’s doing in jail in the first place (dodging the draft, and refusing to take conscientious-objector status), let alone their history in anarchist organizations and their shared hatred of The Man. That would be a little too much even for our Western hero, presumably: better that he be nostalgic about the days of horse and rider herding sheep, and not specifically interested in taking down the federal government. Can’t say I’m surprised. My final gripe would be that the sheriff, Morey, was not cast nearly as fat and bumbling as he reads in the book. At least they left in the taking down of the helicopter; that was fun. This movie is a simplified and sanitized version of the better book upon which it was based; but that’s what I mostly expect from movies made from books. Some of the dialog seems to have materialized out of thin air, most definitely in the case of Jack’s monologue about being a loner – I suspect Abbey could have rendered such a scene much finer (and funnier) if he’d wanted it in his story in the first place. But it was still a fun romp alongside an Abbey-like hero, just dumbed down. I don’t regret my 90 minutes, but it sure is nice to dream about a proper movie made of The Monkey-Wrench Gang or the like. Sigh. Not a bad film, but not too terribly close to its literary origin. Closing credits: thanks to my neighbor Adrian for helping me find this not-easy-to-find movie. You get a 10-star rating, Adrian!